Maybe Scott Proefrock isn't a bozo. 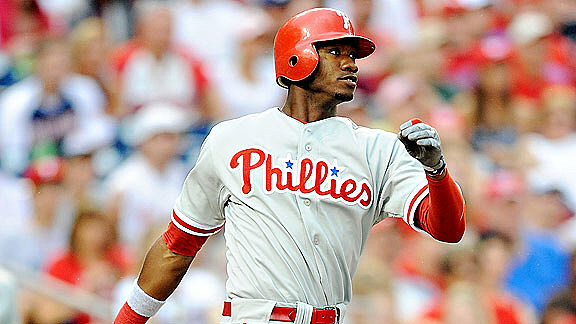 Maybe the Phillies aren't botching this whole Dom Brown thing after all. Maybe Brown is, on both counts.Last week, when the Phillies assistant GM said this -- "Two weeks (of Brown hitting .319 with a .986 OPS, three home runs and two doubles in his last 10) doesn’t exactly establish anything" -- the top takeaway was how badly we needed to establish what the problem was, why the call-up wasn't automated, why it was even a question Proefrock had to answer. (1) Was it the Phillies, for whiffing on the perfect timing to bring up Brown and rectify the organizational gaffe that's been his mismanagement, while all at once giving Phils fans some slim semblance of hope? (2) Or was it Brown? Where was his head? His heart? Would he gell with the clubhouse? Would he crumble under the pressure? Could he handle the whole "Being A Major Leaguer" thing and everything it entails, the day-to-day grind, shagging fly balls and withstanding the media gamut? Seems we have our answer. Said Brown, after the Friday MRI that revealed twerk'd his MCL and PCL (the latter of which is super deep in there and near-impossible to treat with anything but rest): "You seem like you're more stressed out about it than I am. ... Injuries are part of the game. We still have a couple months to go. We'll see what happens. I think I'm in a good spot." Jake Kaplan called that "optimistic." I call it oblivious. Semantics? Nah. Lot of ways to read into that, some refreshing, some horrifying. While it might be oh-so-cliche for me here to call for a little gumption out of the guy, to glean a little disappointment, anger or anything, as so many (often wrongly) do, tired schools of thought get worn out for a reason. Brown, least when he talks like that, is one of them. How he's cool with this -- how he admits as much -- I don't understand. The indifference just doesn't compute. Dude's already had hamstring problems this season -- missed a ton of time -- and won't even blink about a new issue -- with his knees? The same ones that are crumbling beneath Chase Utley as we speak? Guy's had the baseball season equivalent of Indiana Jones in a refrigerator in the opening frames of "The Kingdom Of The Crystal Skull," finally catches a break, and doesn't come close to breaking down once he realizes that he -- and any chance he's got of making it to the majors this season -- just have? Not calling for the guy to go all Tim Tebow. But at a moment in time when the Phils are being blasted for (maybe) not caring, Brown can't muster anything more than a shrug? Maybe that makes him better than us. Maybe that makes him Ricky Williams, his peers Kobe Bryant -- with the connotation being that the first mindset is a hellvua lot healthier than the second. But this is his career, the man's livelihood. I know $600,000, to us, is a fat stash. But when you're the No. 1 prospect in baseball (or at least you were...) the ceiling on your profit potential is a bit higher. Even though it's taken the rest of the guys on this list some time to catch on, Brown isn't even close to that, or their paydays. And Brown doesn't seem to care, even on the most superficial levels. Bare with me through the following deductive reasoning: Brown says the media cares too much about his injury, and it's their job to care about his injury, and he doesn't care about his injury, which is keeping him from doing his job, couldn't you derive that the guy's lacking in professional empathy? Not going to make value judgments about him as a person. I don't know him, and wasn't there to field his answer and get a feel for it. But, if nothing else, the guys' patently disconnected with the woeful chorus his fans are chirping, and the company lines he's supposed to be spitting. He's got to be smarter than that. Even if it's fake, even if he shouldn't have to, the reality is, Brown should've given the people passion. Or, really, anything. Anything but that.